Gerry Lynch's Thoughts… | Just another Friend of Dorothy, trying to follow the yellow brick road to the Cross. Truly spectacular sunset skies at St Stephen’s House this evening. This is, like, where I actually live and stuff. The church is St John the Evangelist, Iffley Road. The Bartlemas Chapel – a name that sounds like something out of Dickens, and the chapel felt like something from a disappeared world as well. A few hundred metres down a laneway from the noise and bustle of the Cowley Road lies a former leper chapel, feeling as if it were behind a portal to another time, when Cowley was still country fields across the River Isis from Oxford. 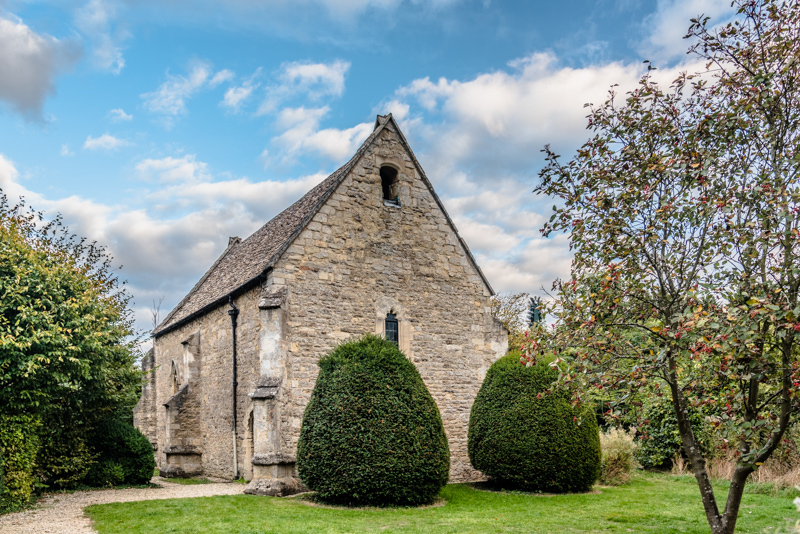 The Bartlemas Chapel was rebuilt in 1326 to replace a 12th Century original. After leprosy was essentially eradicated in the 16th Century, it was used as an almshouse. Later, under Cromwell it was used as a stable, and then in Victorian times as a cowshed. Yet, somehow, the instinct to pray in this place reasserted itself afresh in century after century. 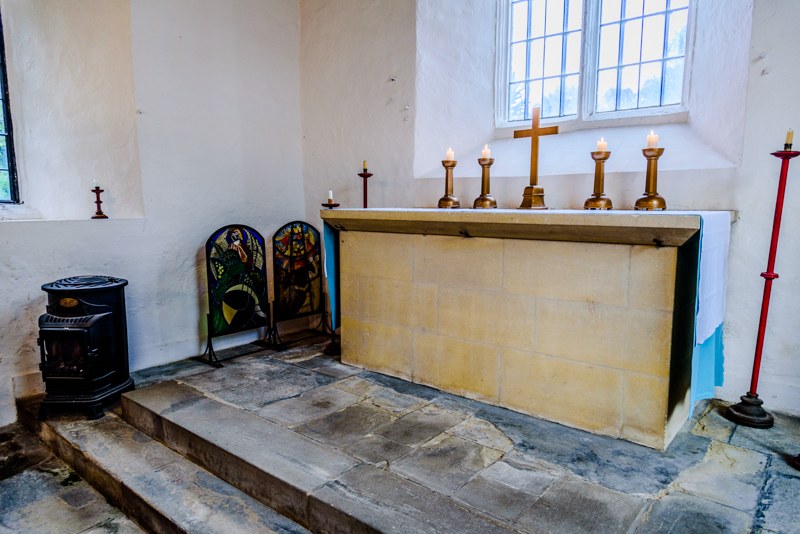 Part of the parish of Cowley St John, Evensong is prayed in this little chapel on the fifth Sunday of the month, under clear glass and whitewashed walls. This will surely be the last such service for some months held without the building’s only heating turned on, a cast iron brazier fired with coal. Dickens would be in his element. Eight of us chanted Evensong from the Book of Common Prayer. The familiar words of the psalms and canticles connected me with the world of daily prayer at Salisbury Cathedral I had just the day before left behind. “The Lord setteth up the meek : and bringeth the ungodly down to the ground.” How appropriate in a leper chapel. “He hath no pleasure in the strength of an horse : neither delighteth he in any man’s legs.” I grinned, as always. Religion that lacks a sense of humour about itself is a terribly dangerous thing. I was connected to many of my own yesterdays; with the people praying the same words in St George’s in Belfast at the same time, and in another St George’s in Cape Town, and dozens of other churches scattered across several continents. But I was connected well beyond that; with the lepers in the reigns of the Henrys and Edwards, sitting in the same spot, for whom the promise of Mary’s song, chanted in Latin, with its exaltation of the humble and meek and filling of the hungry with good things, will have been the only promise of a better tomorrow they heard. Connected still deeper in time and further in place, to the Temple in Jersualem a hundred generations ago, to people praising the Lord for the coming of a restoration unimaginable during the long years of their exile. I pondered that the Liberal Catholic tradition in which my faith has mostly blossomed fears the idea of a mighty God; fears the idea of a God who might need to be feared. We assumed that once given prosperity, security and democracy, people were basically nice. Therefore God must be frightfully nice as well. This was the philosophy that led to whole ‘difficult’ sections of the psalms being eviscerated from the regular round of Anglican worship in 1929. I found it difficult to reconcile this view of progress through reason to universal niceness with the living contradiction that is the Cowley Road: in the heart of one of the wealthiest little cities in the planet, home to what is perhaps humanity’s finest place of learning, junkies scream abuse at strangers from their roadside bedding at the corner of streets where three bedroom terraces sell for over half a million. Difficult to photograph close in due to its dense inner-city site, some say that St Aldegundis is on the site of the original mission church in what later became Emmerich am Rhein, founded by St Wilibrord around 700. That is debatable, but what is certain was there was a collegiate foundation in the town by 914 and that a church on this site burnt down in the early 15th Century. The current building was built to replace it between 1449 and 1514. St Pancratius (de Pancratiuskerk) in the little Dutch market town of ‘s-Heerenberg (population 8,000) and literally a ten minute stroll from the German border. In the north aisle a unusual piece of stained glass catches the eye – is that a Gestapo man in stained glass? The memorial to the fallen of the 1860s Wars of German Unification in the Rheinpark in Emmerich (Kriegerdenkmal, Emmerich). Emmerich is a sleepy little river port on the Rhine, literally within a casual afternoon stroll of the Dutch border. Completed under Wilhelm Kreis in 1913 on the eve of the First World War and deeply redolent of the ‘dulce et decorum est’ mentality which played such a role in that conflagration. Upper text: “Der ist ein Mann, der sterben kann für Gott und Vaterland. EM Arndt.” – He is a man, who can die for God and fatherland. The United States government has launched a new anti-opioid campaign featuring true stories of people so desperate that they inflicted gruesome injuries on themselves to get another prescription. Such stories have already been more effectively told in poetry. The epidemic’s most searing skald is William Brewer, a son of Oceana, West Virginia, a post-industrial town so gripped by addiction that it is nicknamed Oxyana. We cremated my friend James on the freakishly warm Friday before St Patrick’s Day, between the two bouts of even freakier snow. We did this after a celebration of the Supper of the Lord Jesus Christ who was his Saviour and the anchor of his life. The daffodils bobbed in the sunshine as we took his coffin through the traffic from the church in the shadow of St Paul’s Cathedral to the crematorium in East Finchley, his terminus ad quem before his voyage to heaven. As an Angus-born and Edinburgh-reared son of the Kirk, he came to mind after this week’s shenanigans at the Presbyterian General Assembly in Belfast. James lived with MS for thirty years, something unimaginable when he was first diagnosed in the late 1980s. His continued life was a miracle, but it was also a struggle. I never knew the wordsmith, cyclist and cook that his older friends wrote about (movingly here and here). By the time I met him, sixteen years ago, his disease had robbed his legs of the power to walk, left his hands unable to handle a pen or a carving knife, and made his speech slurred and slow. What he was never robbed of was his indomitable spirit, his twinkly smiling eyes, or his dry humour. Nor did MS prevent him throwing the legendary champagne-soaked parties in his Barbican flat, attended by a mix of characters who had little in common but their friendship with this delightful bon vivant: nonagenarian grand dames from Islington garden square mansions would rub shoulders with middle-aged actors struggling long past any hope of stardom and recently arrived twenty-somethings from Doncaster or Brazil, penniless but sure they’d make their fortune in London.